Even after you have laid the groundwork for irrigation or general landscaping trenches, another time-consuming task needs to be completed: the clean-up. The TRENCH'N edge trencher comes outfitted with a special blower that helps to manage the pulled up material. After you have dug the line for your flowerbeds and lawn, you still have yard refuse to clear up. Instead of spending even more time and money to collect and efficiently capture this material, this walk behind trencher blows it onto tarps for easy pick-up. When you work on concrete edging, general trenching, or edge cutting, the last thing you want to do after a long day of work is spend several more hours cleaning up. 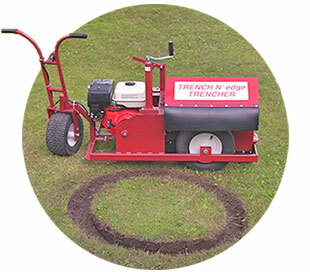 The TRENCH'N edge trencher can also turn on a dime and scrawl perfect curves into the landscape. This portable, cost effective trencher allows the easiest way to install all types of landscape edging like stone, brick, plastic and modular concrete edging like SELECTedge border stones and retaining wall systems. The TRENCH'N edge rotary trencher is the perfect tool for the job. A dual side discharge chute to provide flexibility in discharging material 4 to 6 inches away from the trencher and a cutting blade that is centered between rear wheels, which keeps the trench clean and uniform during tight radiuses that pipe pullers can't match. A new floating cutting blade called the "ROCK-E-VADER". This blade is spring-loaded and cuts up and over underground obstructions like rocks and large tree roots, which saves high trencher blade maintenance costs.